The text of James 1:21 has not undergone any change between the NA27 and NA28, but it has been improved anyway. διὸ ἀποθέμενοι πᾶσαν ῥυπαρίαν καὶ περισσείαν κακίας ἐν πραΰτητι, δέξασθε τὸν ἔμφυτον λόγον τὸν δυνάμενον σῶσαι τὰς ψυχὰς ὑμῶν. διὸ ἀποθέμενοι πᾶσαν ῥυπαρίαν καὶ περισσείαν κακίας ἐν πραΰτητι δέξασθε τὸν ἔμφυτον λόγον τὸν δυνάμενον σῶσαι τὰς ψυχὰς ὑμῶν. The difference between the two Greek texts is the absence of punctuation after ἐν πραΰτητι, which leaves open the question whether 'with meekness' goes with 'putting away all filthiness and rampant wickedness', or, as per ESV and NRSV, with the reception of the implanted word. Though I think (rather strongly, actually) that the interpretation of NA27 is to be preferred over that of the two English translations, I also think that it is not necessarily the case that an edition of the Greek text has to decide this on behalf of the reader. NA28 made the right call not to force the issue. This is, therefore, a good case of 'less is better'. 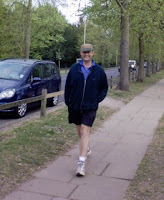 As you may know, co-blogger Peter Head has a long sporting career behind him. He came in 42nd place in the Olympic racewalking in Beijing 2008, after somewhat unexpectedly having received a wild card from the International Olympic Committee to enter the competition. 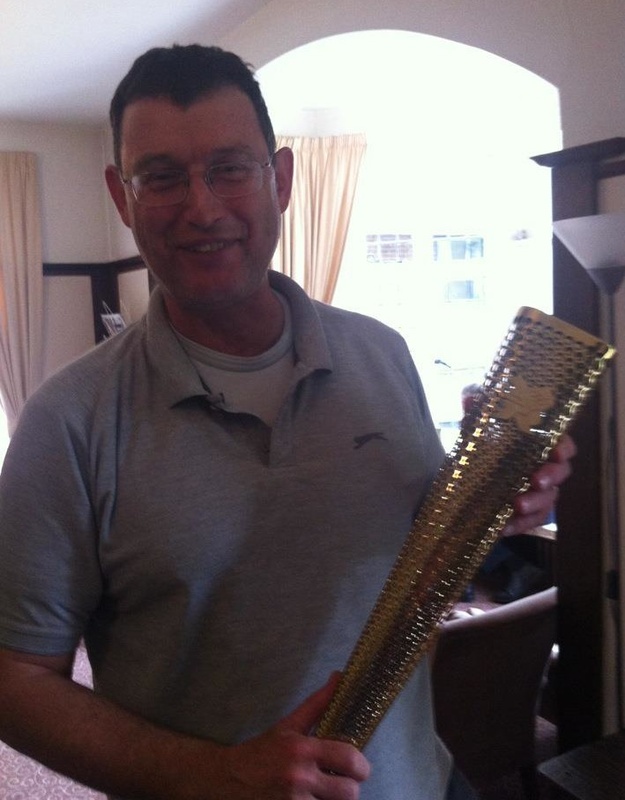 Last year in connection with the London summer olympics 2012, his British colleague Steve Walton got the honor to run with the torch. 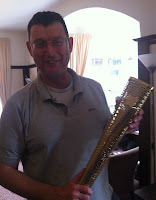 Apparently, the torch made a detour to Tyndale House, so that Pete could once again celebrate his own Olympic memories. Apparently, Peter Head is still a very active man. 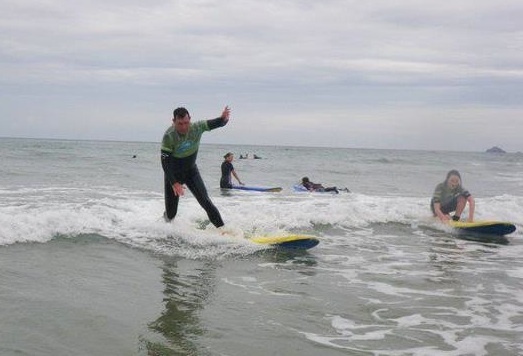 Now he has taken up a new challenge and will participate in the 2013 Swimathon starting today! The swim race is 5 km and Pete is aiming at under 1:30.00 (unless the pool is busy). The Swimathon is actually the world's biggest fundraising swim, and we want to encourage all our readers to sponsor Peter Head and help him raise money for a very good purpose. I have already made my donation! Good luck Pete! Join me, make your donation, and sponsor Peter Head! Over at RBECS Edgar Ebojo has offered a careful review of Charles E. Hill and Michael J. Kruger, eds., The Early Text of the New Testament (Oxford: OUP, 2012). Among other things he pinpoints an interesting notion reflected in the work, in that 'scribal habits' tend to be identified with 'singular readings', with insufficient attention to describing the whole notion (let alone the broader range of phenomena which might go in to understanding the habits of a particular scribe). As a contributor I can see how that could have happened, but I think I must have lent my copy to someone, so I couldn't check this out. Further he adds an impressively humungous list of typos and other problems. The newly published edition of the standard scholars’ New Testament has kept pace with the developments in New Testament Textual Criticism, as evidenced by the application of the Coherence Based Genealogical Method to the text and apparatus of the Catholic Epistles. But the outer margins—which provide parallel references to the Old Testament— have not been revised to reflect advances in the study of the Old Testament in the New and the textual criticism of the Hebrew Bible, Septuagint, etc. I propose to suggest how the next Nestle/Aland outer margins might be revised so as to make this remarkable resource even more valuable. A sample of proposals will be given dealing with the scripture citations in Acts. Review of Nestle-Aland 28th by Dan Wallace. Bonus: vigorous discussion between Dan Wallace and Stanley Porter on Granville Sharp. Jim Spinti of Eisenbrauns tells me that the German Bible Society is going to publish Biblia Graeca – Septuagint and NA28 this fall. The program for the IOSCS Congress in Munich has been posted here. There is a very good lineup of presentations on the LXX for this congress. On day two I will present a paper for the section on Manuscripts. I list the three papers and their abstracts below. Time permitting I will also post on other abstracts of interest. Abstract: RA 788 (Tyrnavos 25) is a tenth century Greek catena manuscript containing the book of Job and the three Solomonic books. Dieter and Ursula Hagedorn were not aware of it and therefore it was not included in their magisterial work Die Älteren Griechischen Katenen zum Buch Hiob or the Nachlese. Before commenting on the hexaplaric fragments, it is necessary to determine the manuscript’s place in the stemma. This paper seeks to show that 788 is a member of oldest Greek catena (Hagedorns’ Γʹ) and in particular that it is the ancestor of the important RA 250. Once its place in the manuscript stemma has been determined, the paper will comment on the significant hexaplaric fragments within the manuscript in comparison with the recent dissertations on the hexaplaric fragments of Job by Nancy Woods and John Meade. Did Origen Use the Aristarchian Signs in the Hexapla? Abstract: Septuagint scholars have debated for over a hundred years as to whether Origen actually used Aristarchian signs in the Fifth Column of the Hexapla or whether the signs were first inserted into a recension of the Fifth Column. A definitive answer to this question can be given by carefully fitting together data from (1) colophons, (2) geography, (3) history, (4) analysis of use of Aristarchian signs and (5) analysis of the textual history of the materials in question. Abstract: In this report, I will first shortly present the codicological aspects of the manuscript; then, I will give a survey of the pluses, minuses and variants of the text of the manuscript in relation to the Old Greek text; next, I will evaluate some of the possible pre-hexaplaric variants in the light of the readings of the Early Jewish Revisors and finally, I will compare and contrast the variants with the Exodus texts as found among the Dead Sea Scrolls. I look forward to attending this congress and also for sticking around for the first few days of IOSOT afterwards. If you plan to be in Munich in August, I would love to hang out. How Many TC Errors in This Statement? As a result of the more recent discovery of many more ancient biblical manuscripts, all early translations, namely those produced before 1993, are essentially out of date—an unfortunate consequece of reassembling a text closer to the biblical original than was possible earlier. With the publication of the most recent editions of critical scholarly texts of the New Testament—the United Bible Society’s 5th Edition of the Greek New Testament (2013) and the soon to be published Nestle/Aland 28th edition (2012) of the Greek Testament—we draw closer yet to the original text of the New Testament, but it would be a mistake to believe that we have reached that goal. There are some challenging and difficult passages to unravel, to which biblical scholars can offer very tenuous, possible solutions, but certainty is not yet available. Since almost all modern translations of the New Testament depend on these two modern texts of the Greek New Testament, translations dating before these editions are not as reliable or as accurate and do not accurately reflect the latest understanding of what the biblical writers wrote.... p. 134.